Web Content: Possibly very complex, but it is posted by one author (in a controlled way), and then displayed in limited universe of computer-based, tablet and mobile browsers (each designed for the primary purpose of displaying the posted content). Email Newsletters & Marketing Pieces: May be moderately complex, but sent by one author using a specific platform (such as Constant Contact or Mail Chimp) that has been configured for the successful transmission of the emailed content. The emailed piece is designed for a single use, meaning that there is no expectation of it being successfully retransmitted by the recipient. Email Signatures: Almost no complexity, but sent by many different users, potentially from a variety of programs and devices (most of which are user configurable). They are then received in the same way - in many different user configurable email programs on a variety of devices. And now comes the killer - the email signature is then expected to survive the retransmission, which, in order to succeed (with the signature intact) requires the second sender’s email client program to have received the original signature intact and to then perfectly interpret it in the retransmission (reply or forward) process. Anyone who’s tried to keep an email signature (beyond plain text) intact throughout the back-and-forth of email correspondence has discovered that it’s a fool’s errand. From a technical standpoint, the only honest conclusion is that email signatures cannot be made to work perfectly. 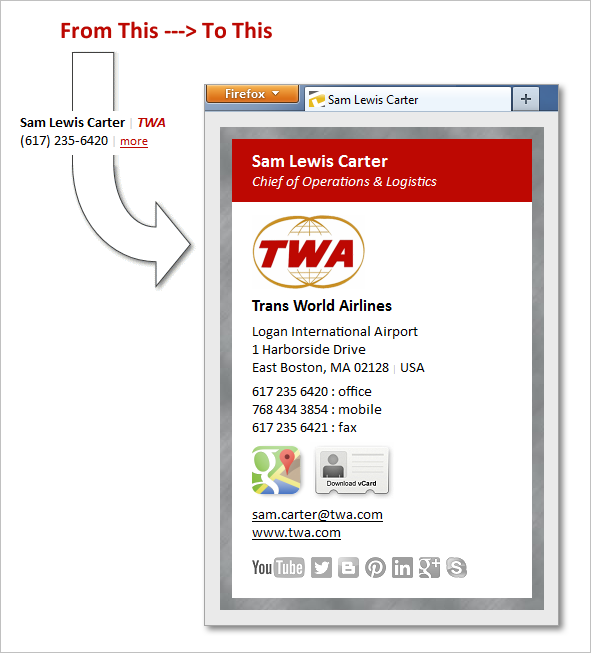 Detailed contact and branding information is necessary or desirable. Minimal contact information is required. No contact information is required. This content of this signature is roughly equivalent to a printed business card, which equates to the standard contact information that one professional would likely share with another. getting included again and again in the same email thread. hoping to have the recipient follow you on Twitter or subscribe to your RSS feed. From a content standpoint, the only honest conclusion is that most of the time an email signature will contain too much information while sometimes it will contain too little. Note that I’m not sure where a typical HR person comes down with regards to this - it seems to be a more recent trend to have HR people taking responsibility for email signatures and so I haven’t had a great deal of experience (yet) in learning their desires. Quite simply, an email signature implementation can never meet marketing’s true measure of success, and almost certainly will fail IT’s as well. At this juncture we have an email signature that will travel very successfully back-and-forth between Outlook, Gmail, iPhone, Android, Mac Mail, Thunderbird, etc. - all technical problems will basically disappear. An added bonus is the lack of clutter this two line text signature adds to email correspondence. Meanwhile, the wealth of contact information is a click away, always available on demand. And because it’s displayed in a browser rather than in an email program, all of the potential of its malfunctioning disappears. The result of this “splitting apart” of the signature from its content is the streamlining of email correspondence with no resulting loss in personal contact data. We move simply from “always there” to “always there when needed” or, in other words, from pesky to perfect!